OGLE-2011-BLG-1444 - Is it a Symbiotic Nova? The discovery of a rapidly brightening object at (RA, DEC) = (17:50:19.27, -33:39:07.3) was announced by Beamin et al. (2013) based on VVV survey data. The object lies in the field observed by the OGLE-IV survey and was announced on 2011 Sep 26 (JD = 2455830.5) as a candidate microlensing event OGLE-2011-BLG-1444 on the OGLE Early Warning System webpage. The light curve of the object in 2011 observing season shows a rapid brightening (0.14 mag/day) since Sep 19 till the end of a season (i.e., Oct 27). During this time the brightness changed from 19.5 mag to 14.1 mag in I-band. The observations returned on 2012 Feb 12. The object brightness was 11.2 mag and the photometry should be treated with caution as the object is close to the CCD saturation limit. Since then it varies between 11.58 mag and 10.24 mag in the I-band. The semi-periodic behavior can be seen with light maxima separated by around 120 d. Since the outburst 41 V-band measurements were obtained. Only one V-band epoch was collected during the outburst in 2011. No significant color variations are seen and (V-I) = 1.5 mag. The reddening for bulge stars in this direction is E(V-I) = 1.25 mag. The object was also monitored during the OGLE-III project between 2001 and 2009. These data do not reveal any significant periodicity or mean brightness variations. However, the OGLE-IV pre-outburst photometry reveals some semi-periodic variability with timescales of tens of days. 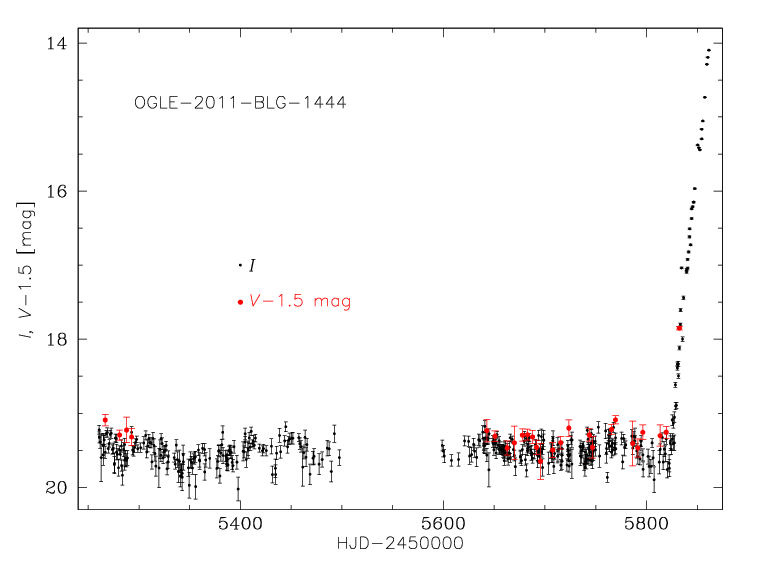 The very long and bright maximum phase suggests that OGLE-2011-BLG-1444 is not a classical nova. Beamin et al. (2013) proposed that the object is a nova-like star based on a spectrum. OGLE light curve does not confirm this. Instead, we suspect OGLE-2011-BLG-1444 may be a member of a small group called symbiotic novae, which show long optical maximum. Full OGLE light curve is presented below. 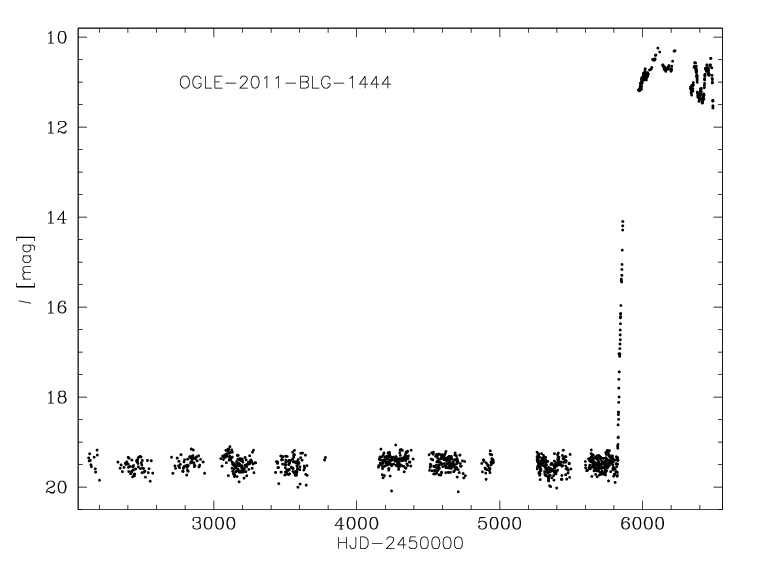 Whole OGLE I-band light curve for OGLE-2011-BLG-1444. 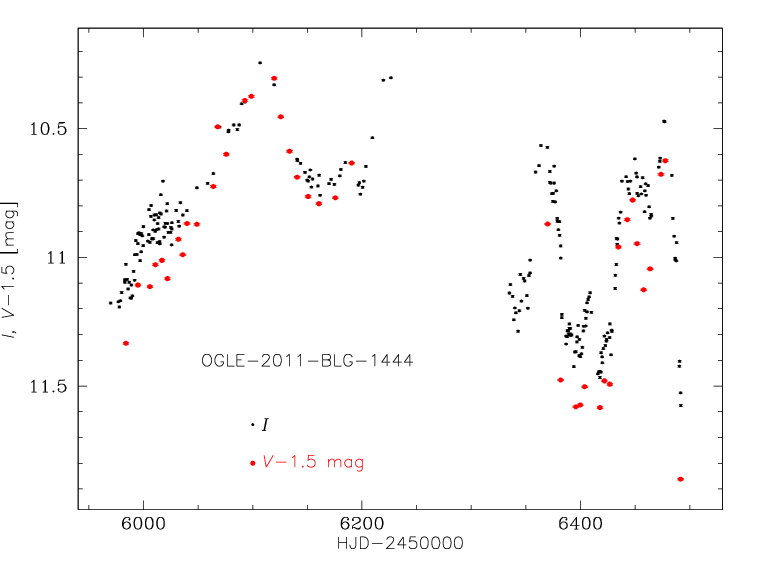 2010 and 2011 V- and I-band photometry of OGLE-2011-BLG-1444. 2012 and 2013 V- and I-band photometry of OGLE-2011-BLG-1444. Questions/comments are welcome and should be sent to this address.